Our DEVOtional 2017 event in Ohio is scheduled at The Beachland Ballroom in Cleveland on Fri. July 28 & Sat. July 29! We’ve got a list of great bands and special guests, plus some highly devolved door prizes for this year’s drawing. Scroll down page for details on the ltd edition FREE GIFT for the first 100 tix buyers, links to pre-order the DEVOtional 2017 Event T-Shirt, and special hotel rates! Here’s the Facebook Event Page. We’re also excited to announce an Akron based ENCORE event in conjunction with DEVOtional 2017: The first annual 5KDEVO Race – Sun. July 30 in Akron! 5KDEVO is a 3 mile race through the streets of DEVO’s hometown as a tribute to Akron’s own devolution band. Participants can run or walk the course, which will be peppered with DEVO historical facts & music. Each participant receives a DEVO tech running shirt, 3D glasses, and the opportunity to receive a highly devloved 5KDEVO finisher medal upon completing course. Additionally, overall & age group awards will be presented at end of race. (Custom 5KDEVO Trophies!) Band members will be waiting at the finish line to congratulate the first few finishers. Proceeds go to a charity of the band’s choosing (TBA). There are a number of options to choose from, including the Virtual Race option for those who can’t physically attend the race in Ohio. First 100 Advance DEVOtional Ticket Orders Receive FREE GIFT! 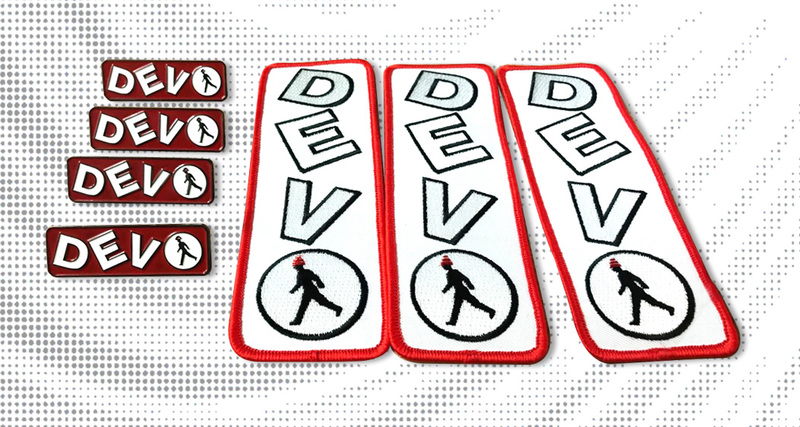 The 1st 100 advance ticket buyers received a ltd edition enamel DEVO pin & embroidered patch set! Only 100 of these pin/patch sets will be made available to the public! All guests will be at Saturday 7/29 event to sign autographs & talk with fans. Some guests may perform onstage with Devolved bands! 8am: 5KDEVO Race in Akron, OH. SPECIAL HOTEL RATES WHILE THEY LAST! Group Rate available from Thursday (7/27) thru Sunday (7/30). See Report From Last Year's DEVOtional 2016!